The Greek island of Skyros is one of extreme natural beauty and charm, and attracts large numbers of visitors from all over the world who come here to enjoy the fantastic beaches, beautiful locations, and the relaxing and friendly atmosphere. It is an island that has so much to offer, and visitors are always rewarded with great memories from their time spent here. Whether you are looking for a holiday where you can simply unwind and relax, or one where you can travel around the explore the island, then Skyros is ideal. One attraction that everyone should try and see is the famous Skyrian horses, which are a unique breed of horse, which has lived on the island since the ancient times. Today the preservation of these horses is of great importance, and there are a few farms on the island where you can visit and see these beautiful animals. The capital town of Chora is part of the island that all visitors will most likely visit and explore. From there you can enjoy some fantastic panoramic views of the island that stretch far across the blue waters of the Aegean. There are many other towns and locations on the island worth visiting such as the coastal resorts of Magazia and Molos which has a gorgeous sandy beach. Other popular places to experience include Atsitsa, Pefkos and Aspous. 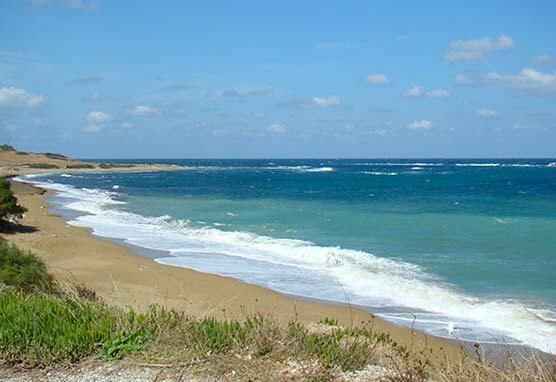 The town of Gyrismata in the north of Skyros is home to a very popular beach which is ideal for those hot summer days. Our rooms and apartments are located just a short distance from the beach here, and provide you with the perfect setting in which to enjoy your holidays in Skyros. Skyros is home to some wonderful beaches where you can enjoy the cool refreshing blue waters. As well as the beaches of Gyrismata, Magazia and Molos you can head off to beaches in Kalamitsa, Pefkos, Yalos and many others. You can reach Skyros by ferry boat or by plane. There are daily ferry services connecting Skyros with the island of Evia, which can be reached by the mainland by car, as well as connections with other islands in the Sporades. The airport in Skyros caters for domestic and charter flights from Europe during the summer period.